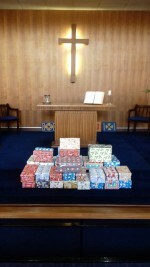 On Sunday 4th November we held our Annual Shoebox Service. The All Age Worship service had teamwork as its theme and we thought about how it takes a dedicated team to get the shoeboxes from beginning in Moston, through the collection point in Wrexham and on to the children and families in Eastern Europe. A number of people took part in the service and the prayers were written and led by our young people’s group. We also thought about how we are God’s team in everything we do as a church. We explored what this means in our mission to the community, our weekly giving and our fundraising for our proposed building alterations. 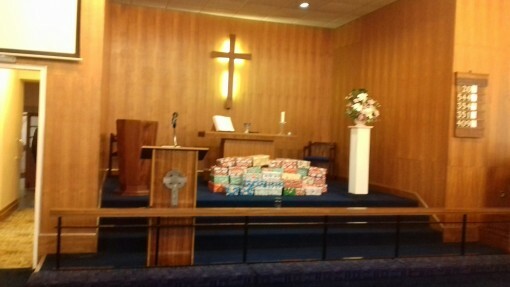 After the service we filled 26 children’s shoeboxes and 4 family shoeboxes. These will now be taken to the national collection point in Wrexham. A great effort from everyone concerned.